Heat the oil in a nonstick skillet, add the chopped mushrooms, fennel, sun-dried tomatoes, and garlic and cook over low heat until the vegetables are soft, but not browned. Remove from heat and let cool. When cool, add the rice, TVP, cheeses, basil, salt and pepper. Mix well and set aside. Blanch cabbage leaves until they are pliable. 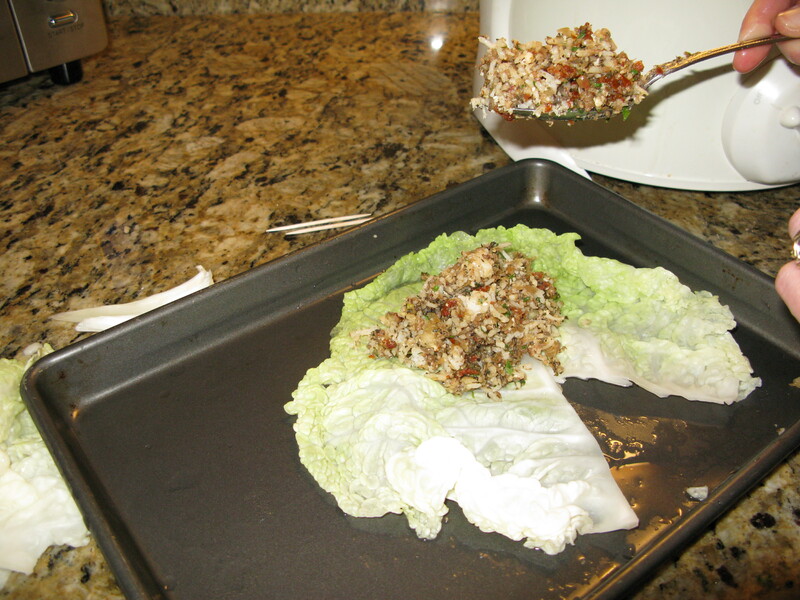 Cut the tough spine out of the center of each leaf and add a couple of tablespoons of the filling to each leaf and roll the leaf around the filling. Hold each unit together with a toothpick. Place the stuff cabbage leaves in a single layer on an oven-proof and then poor the vegetable broth over the rolls and bake for 30-40 minutes in a 350 oven.